In 2007 I obtained a BA DEGREE WITH HONOURS IN LINGUISTIC AND CULTURAL MEDIATION from Libera Università degli Studi San Pio V in Rome with the thesis "Visibility without power": the presence of women in the current Italian and German journalism and the image of women in traditional media (supervisor Prof. Suzanne Sophie Fetzer). During the course of studies I attended an international course in German language at the University of Augsburg (Munich) and in 2007 I obtained the C1-level certificate of German language Zentrale Mittelstufenpruefung at Goethe Institute in Rome. 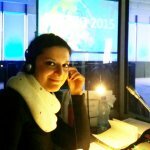 In 2010 I obtained an MA DEGREE WITH HONOURS IN CONFERENCE INTERPRETING from Libera Università degli Studi San Pio V in Rome with the research thesis Machine or computer-assisted interpretation? The relationship between interpreters and Artificial Intelligence (supervisor Prof. Mely Garroni, AIIC interpreter). During the academic year 2008-2009 I won the Erasmus scholarship to the interpreting school Sprachen&Dolmetscher Institut in Munich. In 2010 I attended respeaking courses (by Pablo Romero-Fresco and Juan Martínez) for producing real-time subtitles for TV programmes and conferences. In 2015 I delivered a SPEECH ON THE INTERPRETING AND RESPEAKING PROFESSIONS during the open day organized by Carlo Bo University in Rome. Since January 2017 I have been enrolled as a sworn interpreter and translator for the English and German languages in the PROFESSIONAL CONSULTANT REGISTER OF THE CIVIL COURT OF ROME. - WEBINAR SERIES "IDEAS BY INTERPRETERS" FOR INTERPRETERS IN THE MEDICAL FIELD (Boostlingo).